Okay, I made it. 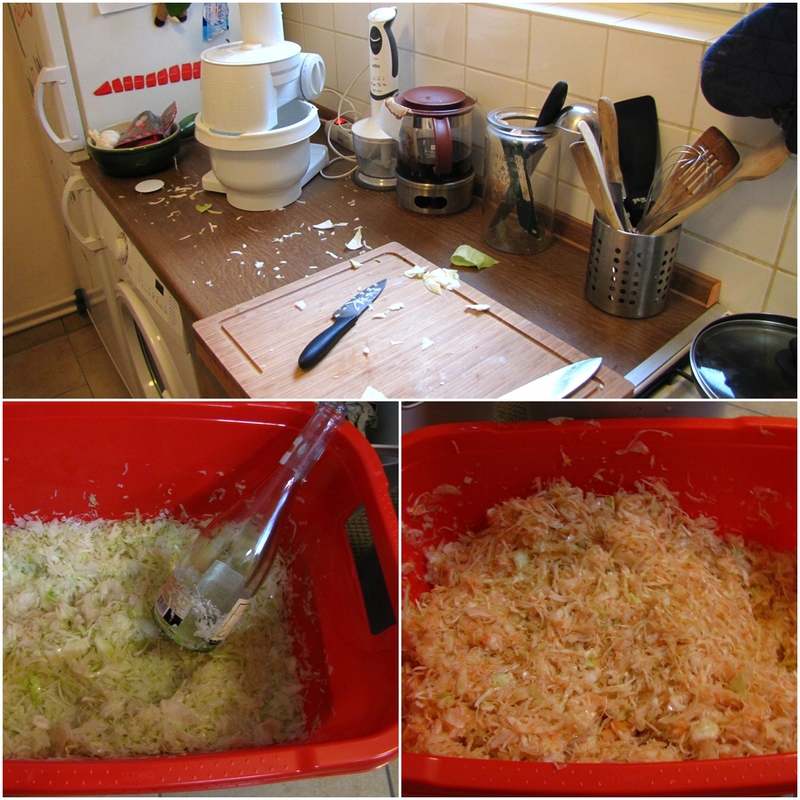 I made Sauerkraut (Wikipedia). I mean come on, I am a Kraut, don't expect from me that I am not eating Sauerkraut even if my regular cuisine is a Meditteranean style. I'd like to share the recipe with you. It's a little bit of work you will have but believe me, it's worth. I am not going to repeat all the nutritional benefits of home made Sauerkraut you can read on Wikipedia but I'd like to show you a traditional way of making Sauerkraut. Yes, you can buy canned Sauerkraut but to be honest I can not stand its' taste. It tastes so strange synthetic. So today I finally made the Sauerkraut. I bought the cabbage yesterday when I leased a car to make some shopping and handle some things in the city. I finally made Sauerkraut out of 26 pounds (11,6 kg) cabbage and something above 2 pounds of carrots. You can use other amounts but think about converting the amount of the salt and sugar. For the Sauerkraut I used a 4 gallons (16 litres) clay pot for preserving pickles or cabbage. It has a special collar where you pour some water after closing the pot's lid to avoid the influence of oxygen. You can take a normal clay pot or even a basket but you have to take care to weight the cabbage with a plate and a stone or a jar with water, so that the cabbage will always be covered with the juice. If the juice runs out you will have to add some water with salt to keep the cabbage covered. 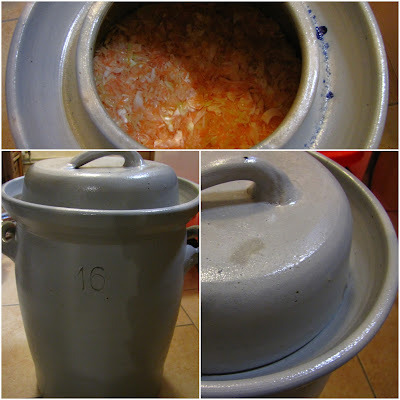 With my clay pot with the collar I can skip those steps and just close the lid, take care that there's always water in the collar and enjoy the fresh sour cabbage after 14 days. If you never made Sauerkraut and you don't want to make such huge amounts, just give it a try with a bigger cabbage in a 1/2 gallon jar. Just reduce the amount of sugar and salt referred to the proportions in the recipe and cabbage weight. [cabbage weight = 100%; 2% of the cabbage weight = salt, some sugar; 10% of the cabbage weight = carrots. For an easier conversion I would use the metric system with grams, for example: 2 kg (2000 g) cabbage + 40g salt (2% of 2000 g) + 200 g carrots (10% of 2000 g) + some sugar]. Clean the clay pot with boiling water. Clean the cabbage, cut out the spadix and rasp it. You can use a food processor I did. Put one portion (about 5-6 pounds) to a basket or a huge bowl and spread some salt with sugar over it. Now the hardest part: usually I should take a traditional piece of wood we call a Krautstampfer (cabbage tamper) for tamping but because I had none I just used a washed in hot water wine bottle (I drunk the wine the other day ;)). Start tamping the cabbage until it starts watering. It took me about 20 minutes with the first portion (sorry to my neighbour in the flat below mine!!!). After you tamped the first portion, rasp the carrots, and add them to the bowl and tamp again. Rasp the next portion of a few pounds of cabbage, add it to the bowl, spread the salt-sugar mixture and start tamping again. Now it will take about 10 minutes. Agitate the cabbage in the bowl well and add some more rasped cabbage and salt-sugar. Tamp again. You will see every time it will take less time to tamp. The cabbage will start watering again. After you added the last portion of rasped cabbage and you used all the salt-sugar, tamp it again for a while. Put the cabbage and the cabbage water on the bottom of the bowl to a clay pot, tamp it a little bit. You will see when you tamp it well, the cabbage should be covered a little bit with its' water. Close the lid, and add some water to the collar. 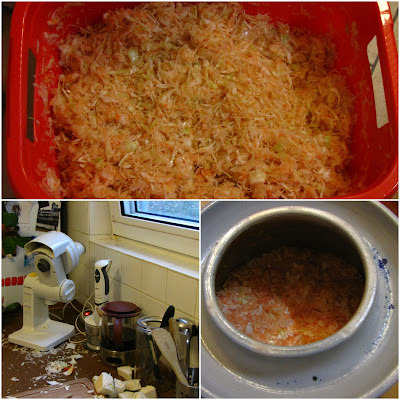 Leave the cabbage for the first week in a warm place and leave the bacilli make their job. Later you can/should put the pot to a colder place (under 15°C/60°F). After about two weeks you can try if the Sauerkraut is ready. You can keep the cabbage in the clay top for the Winter in a colder cellar. 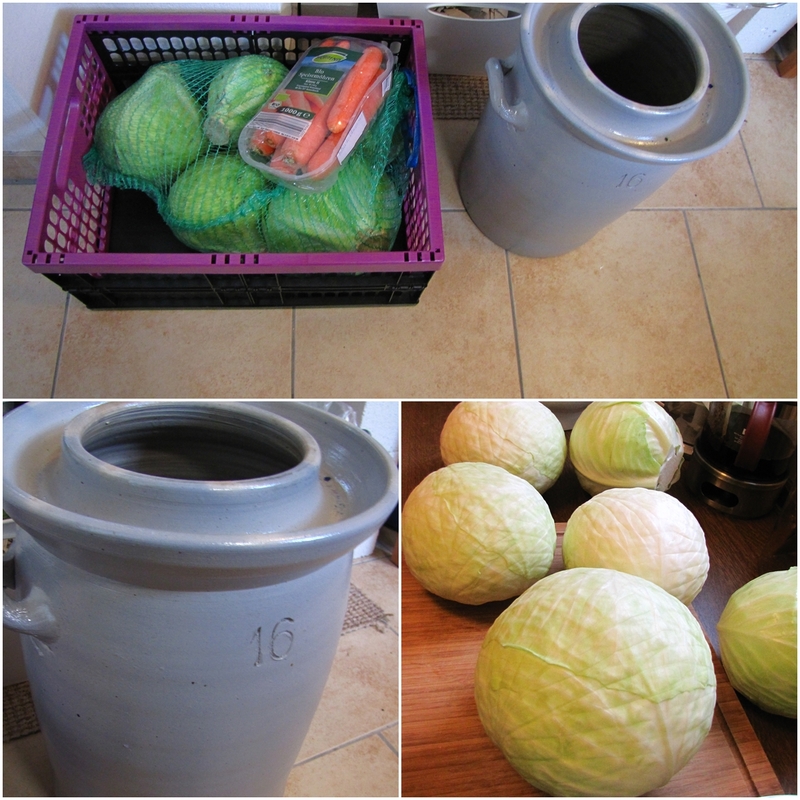 If you don't have a clay pot with a water collar or you want to use a normal clay pot, just after you put the cabbage to the pot, put a big plate over it and weight it with a big jar of water that the cabbage will be covered. Pay attention that after a few days there will be a lot of foam and water so leave some space left at the top of the pot. 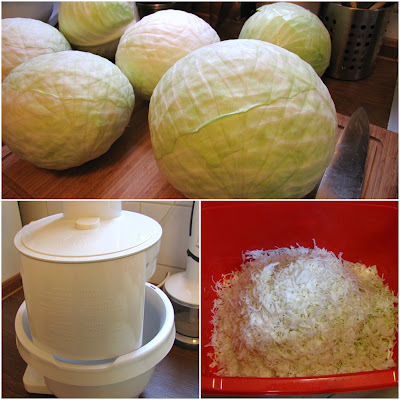 If you see the cabbage is not covered with water, add some saline. The cabbage has to be ALWAYS covered with water. You can also keep the Sauerkraut in jars (later when it's ready). Put some plastic film between the jar and the jar lid - otherwise the lid will start rusting if you use a metal one. Keep the cabbage in a cool cellar. It seems to be complicated but it's not. I wanted to show you as much details as I could so that you won't be surprised during the souring process. Be aware that while keeping the cabbage in the first days in the warm flat, the whole flat will start smelling like Sauerkraut. I don't mind. I like this smell and I always know that when it smells this way, everything is going the right way during the souring process. In a two weeks I'll post some recipes for dishes with the home made Sauerkraut. And even my kitchen looks like a mess on the pictures, I cleaned it in 20 minutes. Without cleaning - it took me 2 hours to make it. Now enjoy the pictures.